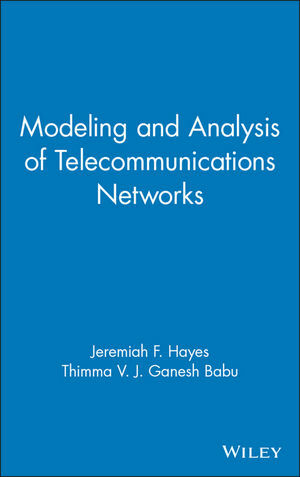 This book covers at an advanced level mathematical methods for analysis of telecommunication networks. The book concentrates on various call models used in telecommunications such as quality of service (QoS) in packet-switched Internet Protocol (IP) networks, Asynchronous Transfer Mode (ATM), and Time Division Multiplexing (TDM). Professionals, researchers, and graduate and advanced undergraduate students of telecommunications will benefit from this invaluable guidebook. JEREMIAH F. HAYES, PhD, received his PhD in Electrical Engineering from the University of California, Berkeley, in 1966. Dr. Hayes is recently retired as Distinguished Emeritus Professor of Electrical and Computer Engineering at Concordia University. He has held visiting positions at several institutions, including the Jet Propulsion Laboratory, IBM Zurich Research Laboratory, Bell Communications Research, Bell Northern Research, University College, Cork, and the University of Canterbury. In recognition of his contributions, Dr. Hayes was raised to the rank of Fellow of the IEEE in 1983. In 1996, he was the fourth recipient of the Canadian Award in Telecommunications Research. THIMMA V. J. GANESH BABU, PhD, received his PhD in Electrical and Computer Engineering from Concordia University, Montreal, Quebec, Canada, in 2001. He has been a Member of Technical Staff at EMS Technologies, Montreal, Quebec. He is a telecommunications consultant and part-time professor of Electrical and Computer Engineering at Concordia University.